When you are having friends over for dinner, the key thing is to make something quick and easy so that you can enjoy the evening with your guests. The last thing you want to be doing is spending the whole night in the kitchen! 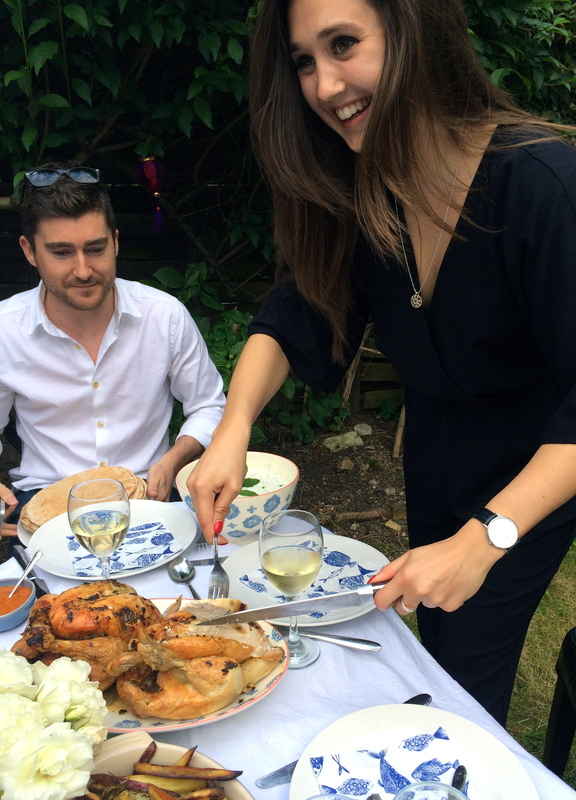 This weekend, I was having a few friends over so decided to do roast chicken, sweet potato fries, tzaziki, halloumi and wraps. It’s a particularly good meaty one to do if you’ve got lots of boys round too! The whole thing can be prepared beforehand, and all you need to do is pull the chicken and fries out of the oven when everyone is ready to eat. Everyone can dig in and help themselves, so it’s the perfect sharing supper. Grab yourself a big handful of mint, a cucumber, and a tub of Greek Yogurt. Finely slice the cucumber and mint, and combine it with the yogurt. Squeeze in the juice of a whole lemon, and season well. This is ready to cover and put in the fridge until you bring it out later. 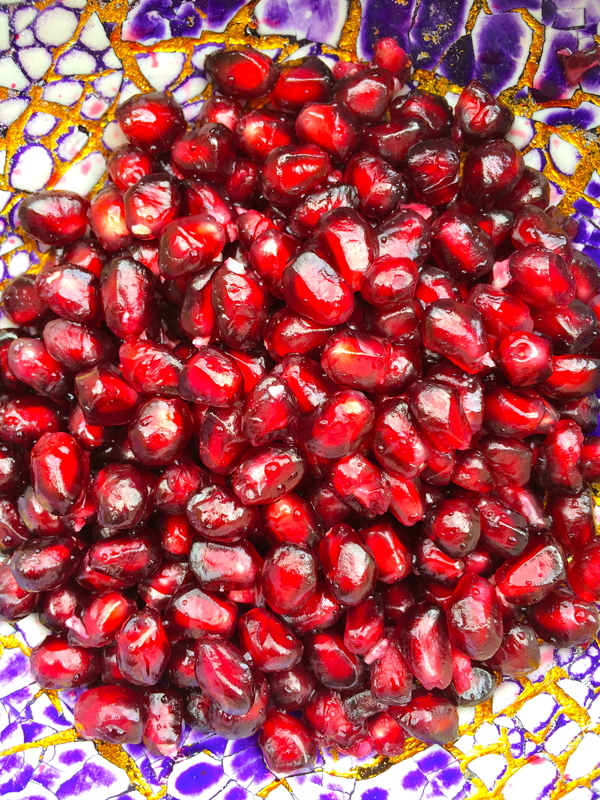 Chop a pomegranate in half and empty its seeds into a bowl. Make sure you wear an apron, it’s messy business! 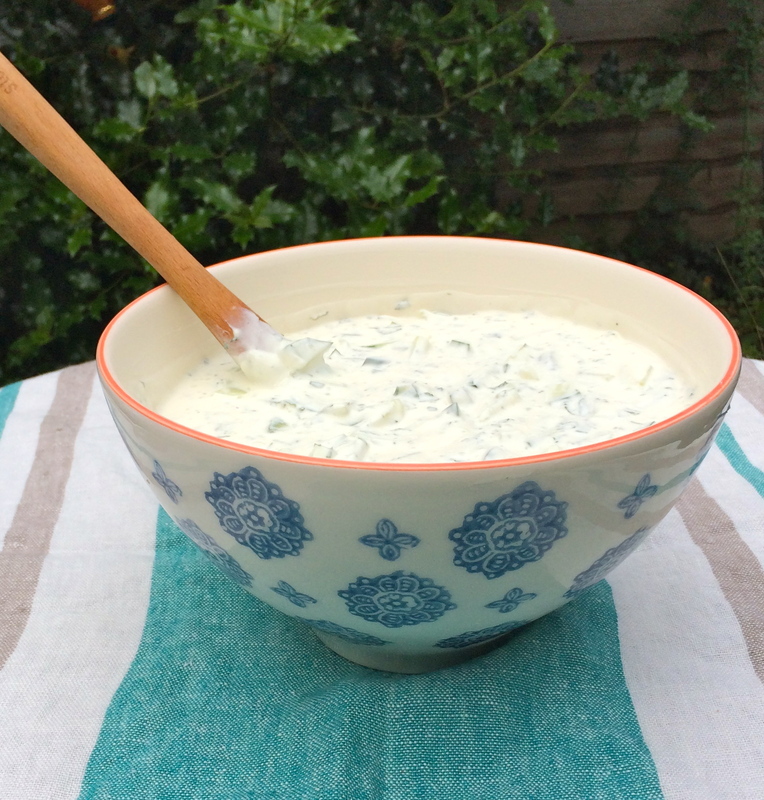 Set this aside until later, when you just need to mix it in with some grilled halloumi. 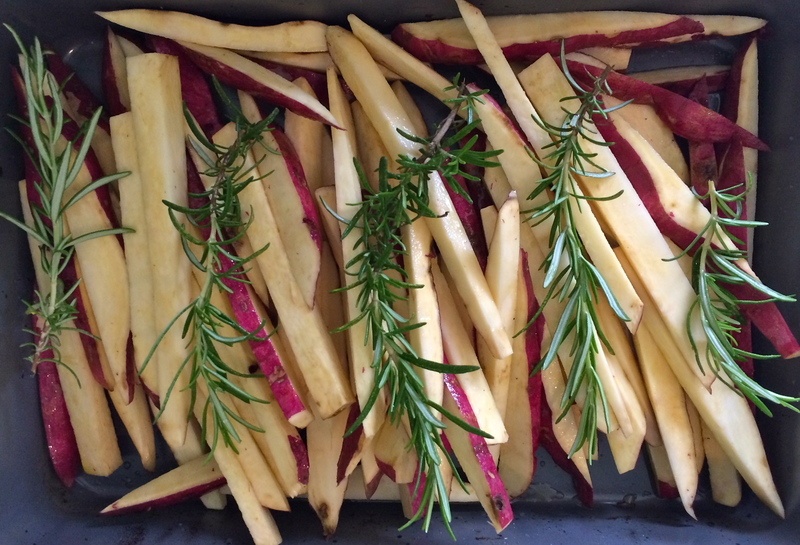 Get some sweet potatoes… … chop them into thin strips, cover them in olive oil, throw in some sprigs of rosemary and season. Finally, prepare your chickens. I rubbed in some garlic and herb butter to make the skin nice and crispy, pierced the skin and popped a couple of garlic cloves in, and stuffed each one with half a lemon. They take about 1hr 20 mins to cook, so when you’re ready, pop them into a 180 degree oven. Once they have been roasting for about 40 mins, stick the tray of sweet potatoes in too. Once cooked, all you have to do is lift it all out and put it on the table for people to help themselves. Luckily the sun finally came out and it warmed up enough for us to eat outside! Carve up the chicken first… I would probably advise leaving this to the boys- I soon found out that carving isn’t my forté! Serve it with some lovely big flatbreads and piri piri sauce, so everyone can load up their own wrap and get nice and messy. Its a good one for people to keep picking at, and there’s plenty of chicken for everyone to go back for seconds! 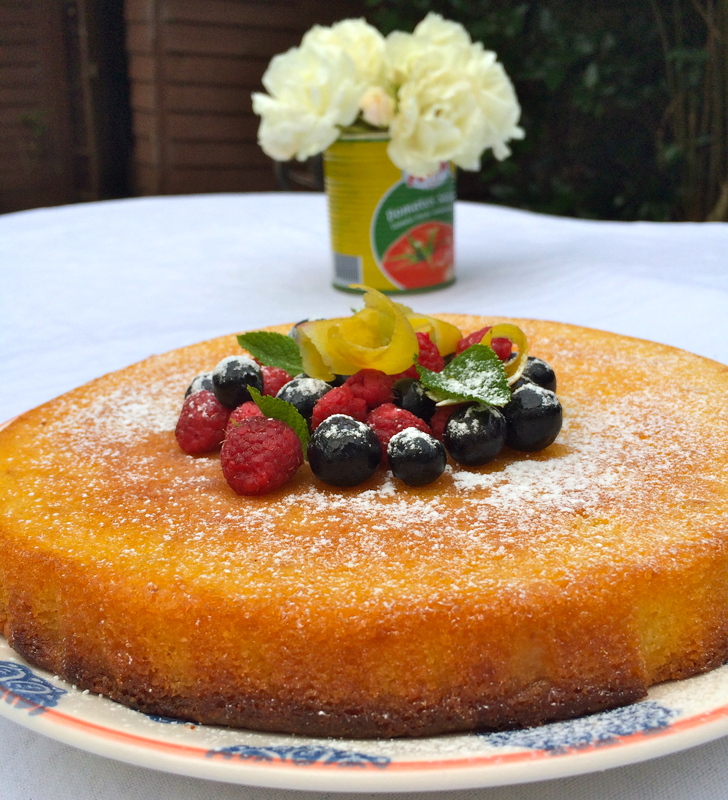 I finished the meal off with a lemon polenta cake for pud, to stay in-keeping with the whole mediterranean theme. I’ll put the recipe up for the cake in a separate post for you! And there you go, simple as that. 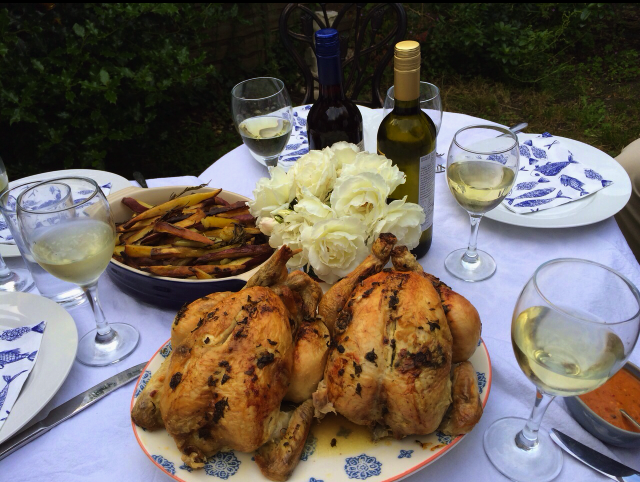 A lovely summery supper that’s easy to make for a large group!